You’re thinking about a health-related career—but there are so many options! This guide can help you consider career possibilities, choose a suitable major, and know where to get help. Which health-care career might be right for me? What majors are best for a health career? What courses should I take? What do professional schools require? A career in health care can be satisfying and meaningful, allowing you to combine scientific knowledge and technical expertise with a focus on working with and caring for other people. Employment opportunities in this area have generally grown even during periods of economic downturn. Physicians, who complete medical school plus a specialized residency and hold an MD or DO degree, might be the first health professionals that come to mind. Or, you may think of dentists, who earn a DDS or DMD degree and may specialize in an area like orthodontics or periodontics. A veterinarian (DVM) completes similar training for the care of animal patients. However, there are many more options! You could become a physician assistant, who works under the direction of a physician and can specialize in a particular kind of care. Or, you could choose a specialized medical program such as podiatry. Specialized nursing careers like nurse practitioner or nurse anesthetist provide another alternative. Many additional fields offer patient-care opportunities, such as nursing, pharmacy, optometry, radiation therapy, physical or occupational therapy, nuclear medicine, or dietetics. Science, medicine and psychology come together in new fields like genetic counseling and rehabilitation counseling that also involve direct patient contact. Not all healthcare careers deal directly with patients, however. Public health areas such as epidemiology deal with the source and spread of disease. And, a wealth of healthcare careers can be found behind-the-scenes in areas such as medical administration, health education, healthcare policy, or medical informatics. Most of these careers require post-graduate study. While most don't specify a particular major, they do have specific pre-requisite courses. You should explore options and learn about requirements early on, so you can make good decisions about majors and courses. Getting experience such as shadowing can really help you narrow down your healthcare interests! North Central College offers a number of majors that can help you prepare for a career in a health field. And, our liberal-arts core will give you an edge with writing, presenting, critical thinking, and problem-solving skills. Click a major below to learn more. 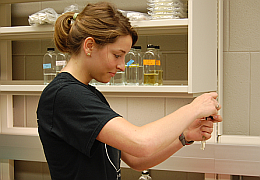 Biology BS, Biomedical Science track: rigorous science preparation for medical, dental or veterinary school. Biology BA, Health Professions track: strong science preparation with flexibility to choose support courses that fit health programs such as nursing, PA, PT, optometry, OT and others. 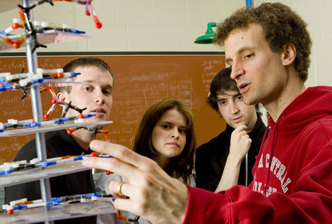 BIOCHEMISTRY focuses on the cellular and molecular aspects of life. This major is appropriate for pre-medical and pre-dental students, especially a BS with advanced electives chosen to strengthen pre-health preparation. CHEMISTRY offers a BS option featuring strong preparation in the chemical sciences and additional courses in a professional focus. The health focus meets most pre-requisites for students pursuing a medical or health-related career. EXERCISE SCIENCE is a good major for students planning on careers in physical therapy, with electives chosen to meet entrance requirements. NEUROSCIENCE is a growing area at the interface of biology and psychology. The Molecular Neuroscience track can be a good option for pre-health students with a strong interest in the workings of the brain and nervous system. NUCLEAR MEDICINE TECHNOLOGY is a specialized program, training technicians who use radioactive materials to diagnose or treat disease; its final year is clinical training at Northwestern Memorial Hospital. PSYCHOLOGY is an appropriate major to prepare for occupational therapy, with the addition of pre-requisite science courses. RADIATION THERAPY is a specialized major leading to a career as a radiation therapist, administering diagnostic imaging procedures. The final year of this major is completed at Northwestern Memorial Hospital. Some possible careers in medical and health science areas are listed below. Most require additional education in a professional program beyond your NCC degree, and each program has specific requirements for admission. Click the career you're interested in to learn more, but remember you should always check the Web site of a particular program you're interested in to be sure you'll meet its requirements. Education: nursing school (2 yrs); further study and experience for nurse-practitioner (NP), nurse-anesthetist, etc. PRE-HEALTH ADVISOR Marguerite Degenhardt has extensive experience helping pre-health students prepare for admission to professional programs and provides many avenues of support, including one-on-one guidance as well as pre-health programming and campus events. FACULTY mentor pre-health students in and out of the classroom and in the research lab, helping them choose among career options and develop academic programs to achieve their goals. ADVISORS are trained to work with students to develop plans for a variety of majors and minors and can help plan for pre-requisite coursework. PRE-HEALTH ORGANIZATION (PHO) is a student organization that brings speakers to campus, organizes enrichment experiences, helps pre-health students find shadowing and other opportunities, and provides opportunities for leadership experience.